My kids SO loved the rainbow Jell-o treats I made for my 4-year-old's rainbow birthday party, that I wanted to do a version of it again for my 7-year-old's cowgirl party. I decided to just try and match the color scheme of pink and turquoise and make it more wild and random than the nice, orderly rainbow Jell-o I had done previously. So here's what we created! Rather than make individual treats this time (I figured the kids didn't need, and wouldn't want, a whole cup with all the other treats available), I made these finger-food size--just right for stuffing one in your mouth. 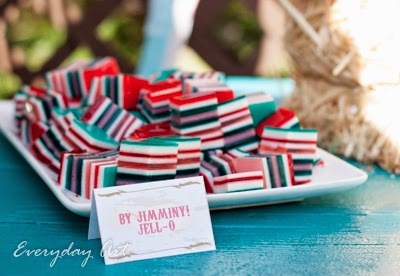 To make the layered Jell-o bite-size, I made it all in a big 9x13 baking dish then cut it and scooped it out. Some of the layers fell apart when scooping it out, but I didn't care--I wanted a big pile of jiggely Jell-o! 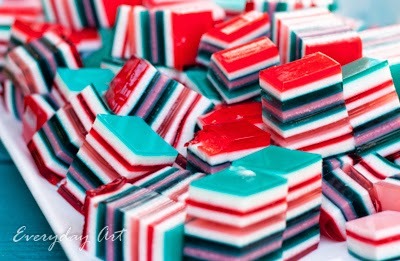 You can get the whole recipe from the rainbow Jell-o post, but here it is again with the modifications for the bite-sized pink-and-turquoise style. 1. Get 3 bowls out to start (2 small and 1 medium). You will be mixing 1 box of Jell-o with 1 cup boiling water and ½ cup cold water. Make the pink Jell-os separately in the small bowls. To make turquoise, mix the green Jell-o with the 2 boxes of blue Jell-o in the medium bowl. To this add 3 cups of boiling water and 1 1/2 cups of cold water. 2. Heat the milk in a saucepan over low heat just until it reaches a lukewarm temperature. Meanwhile, in a large bowl, mix together 1 cup boiling water with the envelopes of Knox gelatin. Whisk together until the gelatin is completely dissolved. Add the warm milk, yogurt, sugar and vanilla extract and whisk until thoroughly combined and completely smooth with no lumps. 3. Pour the first color into a 9x13-inch pan and refrigerate until set (about 45 minutes but can vary depending on the temperature of your fridge and how full it is). Once it's set, very gently pour some of the yogurt mixture on top. If you want your layers to be uniform, then measure equal amounts for each layer. I wanted mine to be random, so I just poured it on, trying to make thin layers and thicker layers. Return to the refrigerator for 45 minutes, or until set. Repeat with the colors and yogurt mixture until the last color is used (you will have some mixtures leftover). When finished, refrigerate for at least another hour. Store in refrigerator until ready to serve; refrigerate leftovers. Before serving, cut the Jell-o into cubes and scoop out. It will be impossible to keep all the cubes in tact, but this recipe makes a lot, so don't worry about it. If you are serving this somewhere warm, then it helps to chill the serving plate.